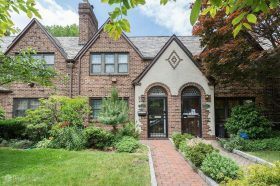 Just adjacent to the historic “secret” enclave of Forest Hills Gardens, Queens–a rare planned community founded in 1909–is the even more well-kept secret of Arbor Close. These garden-filled idylls share the same covenant to maintain their early 20th century “garden city” charm. Like its neighbor, Arbor Close consists of 1927-era Tudor rowhouses and apartment buildings with central gardens. Though it doesn’t happen too often, one of those rare homes, an elegant, unassuming Tudor at 111-27 75th Road, is for sale, asking $1.275 million.